The pitcher is one of the best closers in college baseball. 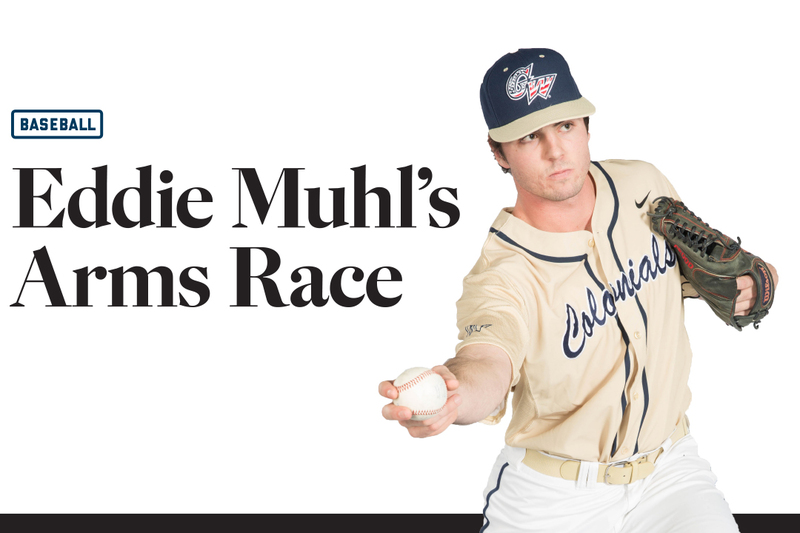 On his way to being, statistically, one of the two best closers in college baseball last season, Eddie Muhl tried just about every arm slot available to a pitcher. He eventually settled on a trebuchet-like, three-quartersy sidearm delivery, and with that, the 6-foot-4, 225-pound GW righthander tied Radford University's Ryan Meisinger for the most saves (17) in Division I in 2015. It's the result of a six-year trek of discovery that tested his patience and the elasticity of his rotator cuff. Mr. Muhl threw overhand and submarine and cameoed at every delivery in between, looking for a release that he could make his own. For Mr. Muhl, a contemplative junior from suburban Los Angeles, the best way to explain how he persevered is with an analogy. A guitarist—he favors a cherry-red Epiphone Dot—he says that his search for a pitching style is not unlike a musician's search for a sound. "If you do every throwing drill and every exercise and everything perfectly, you might pitch really well and you might pitch right and you might get people out," says Mr. Muhl, who digs classic rock and quotes Jack Kerouac. "But I think you have to really grasp the essence and move forward with that, through your own interpretation. And I think that's why things like blues and all that are so beautiful, because you can have Jimi Hendrix and Stevie Ray Vaughan, and you can tell which one's which. They put their mark on it and they kind of change it for themselves, and it's the same thing about pitching." Last season, as a sophomore, Mr. Muhl had a 2.13 ERA, striking out 20 batters and walking just six in 241⁄3 innings. He gave up 22 hits, just four of which were for extra bases. He didn't allow a home run. Mr. Muhl relies not only on his deceptive arm slot—it hides the ball during his windup, making it harder for batters to see the ball early—but also on superlative location and lots of natural movement. No pitch in the junior's arsenal—changeup, slider and an 89-mph two-seam fastball—goes anywhere close to straight, and when he first found what would become his arm slot, his pitches moved so much that he had to shift where he stood on the mound. During a spring intrasquad scrimmage three years ago, GW coach Gregg Ritchie, BA '86, suggested that Mr. Muhl throw sidearm. The then-freshman did, and promptly hit three batters. In a row. Mr. Ritchie's reaction was ... unexpected. "He was happy," Mr. Muhl says with a laugh. "I remember this very clearly: He came out and talked to me and he asked, 'Do you know what you're doing wrong right now?' And I said, 'Of course not. I have no idea what I'm doing wrong.' And he moved me over from the right side—the third-base side of the rubber—to the middle and he said, 'Just keep doing what you're doing.' And I went back up there, and, all of a sudden, the ball started to drop right in on the inside corner." The change has helped Mr. Muhl go from a high school player whose next-best offer was a Division III school to one of the top relief pitchers in college baseball. And as he's picked up more velocity on his fastball, Mr. Muhl has moved his arm slot incrementally higher to get to where it is now. Mr. Muhl also experimented with different releases in high school while playing for the powerhouse program at Notre Dame in Sherman Oaks, Calif., of which Florida Marlins all-star outfielder Giancarlo Stanton is an alum. Notre Dame coach Tom Dill says Mr. Muhl, who didn't pitch until high school, could always locate his pitches, regardless of how he threw them. "He always gave you a shot because he pounded the [strike] zone," says Mr. Dill, in his 25th season coaching the Knights. "As he got older, he developed more pitches, and when you talk about arm slot, he could throw over the top, he could throw three-quarters and he could throw from the side—and he could mix that up." And he still can. He just doesn't have to. The annual regatta is one of the premier rowing events on the East Coast. This is how it comes together. Alumnus wins 2016 World Marathon Challenge while running to honor slain servicemen.